Providing outstanding stain removal London services is what helps our London carpet cleaners stay on top of the competition, covering all areas. Call 0208 861 0979 for a free quote! Stains can be so stubborn! They can destroy all your favorite belongings, furniture and carpets. If this happens – do not hesitate, call Magic Carpet Cleaning – we’ll remove stains from even the toughest furniture, fabrics and flooring – to complete impeccable cleanliness! Why Choose Our Stain Removal Services in London? Best offer price for quality – which gives you a 100% guarantee to our customers for maximum satisfaction! Use of environmentally friendly products according to the type of the stains and spots. Our cleaning experts work quickly and reliably – see for yourself, become one of them today! Our customers enjoy special treatment and recommend us as a trusted partner! Discover the impeccable working style of Magic Carpet Cleaning! We have hundreds of recommendations for our expertise in stain removal which can be presented upon request. What is the stains removal London service? Stains removal is our cleaning service that clears away all traces of dirt or any other type of temporary marks from your carpets and upholstery. As you may already know, the longer the stains stay on your carpets or upholstery, the harder it is to remove it. Most of the time, it’s quite easy to remove stains from carpets and upholstery if you have the right cleaning equipment and chemicals. However, tough stains are harder to remove and have to be done the proper way, using both suitable stain removal solutions as well as technical skills. Now, we’re delivering bespoke services of stains removal to all of our London based customers. We appoint professional, London based carpet cleaners who are certified and insured to do their jobs and have expertise and knowledge to provide expert advice on stains removal. Our complete stains removal service has been especially designed to help you deal with the most difficult spots. Just to make sure that we’ll remove all unnecessary stains and temporary marks, our London teams stock over 15 different stains removal chemicals and liquids. In other words, we can tackle and remove any type of stain from your carpet or upholstery, for your piece of mind. We also use a unique stains removal method which puts our technicians’ experience and full training certifications to good use: first of all, our team assess the type of stain they have to deal with and assign the right stains removal liquid or chemical. Usually, the type of stains removal chemical or liquid we use are part of the Prochem™ range which we’ve found to be the most effective solution, based both on our tasks and on our seven-years long experience in this field. Secondly, our team gives a final rinse to the carpet or upholstery item to remove all other residual traces and to ensure that the item is freshly clean. Lastly, the team re-assesses the result to make sure that the stains have been removed and that the quality of the result is exceptional. Most of the stains can be removed even without the help of our London based professionals. 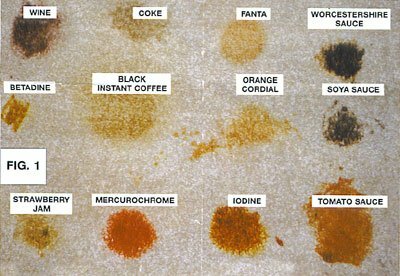 However, please keep in mind that using the wrong type of stains removal product can negatively affect your carpet or upholstery item. During our seven years long activity, we’ve acknowledged that most of the stains we had to remove had been made worse by clients using the wrong stain removal products. Always read the labels: Please read both the label on the fabric and the one on the stains removal product you plan on using. Not doing so will increase the chances of the stain turning worse and much more difficult to remove. Use an experienced, fully trained stains removal expert: All of our London based teams are fully trained to the standards set out by our industry and they know what they’re doing and how to remove even the most difficult stains out there. We’ve been providing stains removal services for over seven years now and we know which products to use and how to properly remove stains. As you may already know, pet stains are difficult to remove for several reasons, detailed below. First of all, stains caused by pets’ urine — as well as its smells — are virtually impossible to remove, even when using the most powerful hot water extraction equipment available out there. The reason behind it is that urine quickly sinks into the deepest layers of the carpet or upholstery item, all the way to the base of the piles or even at the underlining layer of the fabric. The result is a stain which is very difficult to remove. Secondly, the ordinary cleaning techniques as well as professional steam cleaning approaches fail not at removing stains but at removing the smell, as well. We can, however, tackle pet stains by using both our professional equipment and fully trained staff, as well as powerful cleaning solutions such as those from the Scotchguard™ range. From our experience, we’ve found out that this approach always brings in great results and it also increases your carpet or upholstery item’s resistance to soiling, whilst also preventing spills and water-based spots to turn into stains which are harder to remove. We provide stains removal services to both commercial and residential customers, in London. These include professional removal of common stains, such as those made by pets, for example, as well as of industrial-strength. What’s more you can take advantage from our range of professional cleaning services, too. For commercial facilities and businesses in London, we provide bespoke stains removal services. Our cleaners cover all of London and they have been professionally trained and are fully qualified. Our teams can deal with the most difficult stains and can cover any project of any size. We also provide method statements and full risk assessment for each of our commercial services. Most of our London based customers use our stains removal service on a regular basis. That is because we get great feedback from our previous clients and from our partners, as well. Furthermore, our staff is fully qualified to tackle even the most difficult stains. Your residential London property can always benefit from excellent stains removal services, as we are only a phone call away, so feel free to contact us for advice and a free quote. For outstanding stain removal London services, call our London carpet cleaners now on 0208 861 0979!